With the right design, aspheric optics can reduce the number of lenses needed for properly conditioning light in an optical path. For complex lens assemblies such as zoom lenses, one or two lens elements can often provide the functions of two or more conventional lenses, using less space and requiring fewer alignment procedures. Component count reduction helps to decrease size and weight, as well as simplify optical assembly. An aspheric surface profile can be designed and fabricated to reduce or eliminate spherical aberration that can cause a variety of problems for imaging or other optical systems. Spherical aberration occurs when incident light focuses at different points, some distance from the theoretical focal point. In imaging systems, for example, this causes blurring. With an aspheric lens, light can be focused to a point, so that there is little or no perceptible blurring, and image quality is improved. The use of aspheric lens solutions can thus help to eliminate the need for additional corrective optics that compensate for spherical aberration and related problems. 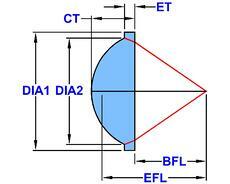 Another form of aspherical lens, a hybrid aspherical lens, can also help to provide color correction. Medical Imaging and Instrumentation – Aspheres are often used for miniature instruments or compact imaging systems. Consumer Imaging – Aspheres for consumer cameras on a range of devices offer high quality imaging from molded optical materials. Security Imaging and Sensing – Aspheric designs simplify lens structure and improve image quality, eliminating components in some cases. Illumination – Aspheric lenses and lens arrays help to direct light efficiently from the illumination source. Solar Energy – Aspheric prism surfaces and aspheric lens arrays help to concentrate light for a number of solar energy devices. Communications – Aspheres can be used to collimate light emitted from a laser diode or from an optical fiber. Learn more about how aspheres reduce optical system size and improve image quality: Download Aspherical Solutions for Innovators.